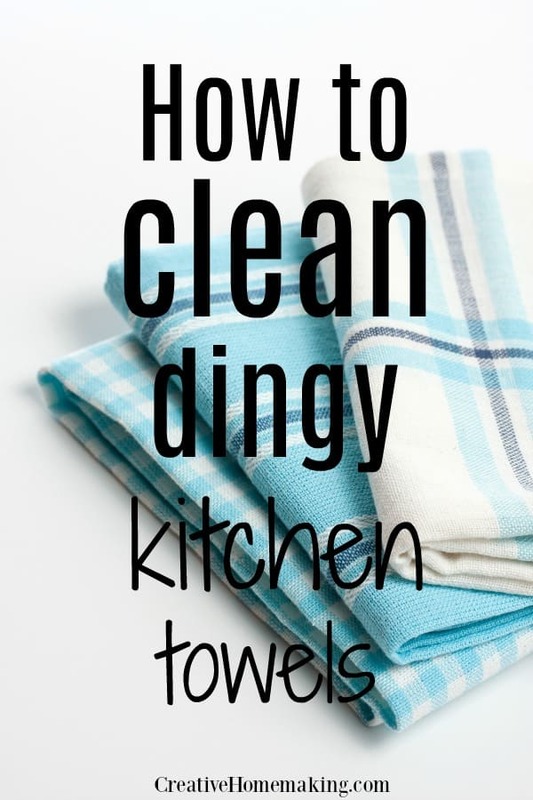 January 31, 2019 1 comment on "How to Clean Dingy Kitchen Towels"
Do your kitchen towels smell bad no matter how many times you wash them? 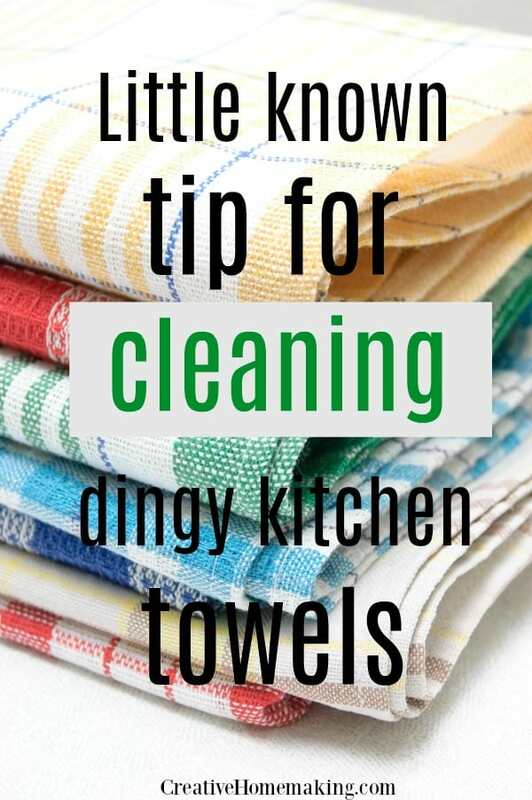 I have always cleaned my dingy or greasy kitchen towels separately from our other laundry, but I never realized that there are several other do’s and don’ts for washing kitchen towels that really make a difference. One of the big no-no’s for washing and caring for kitchen towels is that you should not use fabric softener on them when drying them in the dryer. Fabric softener actually puts a coating on your towels that makes them less absorbent and also helps trap funky smells in them. 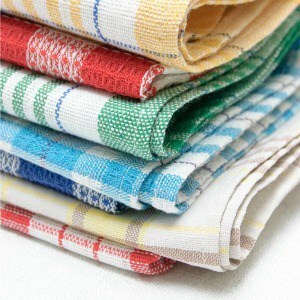 A great cleaner for kitchen towels is common household ammonia. If you place about 1/2 cup of ammonia in the washing machine along with your normal laundry detergent, the ammonia will strip all of the grease and dirt from your kitchen towels. You also want to use hot water to wash the towels, and if you are only washing a small load of towels, set your washing machine to use as little water as possible so the cleaners don’t become too diluted in the water. After you place the hot water, ammonia, detergent, and towels in the washer, let everything soak for at least an hour. Then let the washer finish the cycle. If you want to use a fabric softener, use white vinegar in the final rinse. The vinegar will not coat your towels and will help to disinfect them. The best way to dry the towels is outside on a clothesline. The sun will help to bleach the towels. Using a dryer is fine too, as long as you don’t add fabric softener. I washed my kitchen towels in this way today and I was very happy with how clean and soft they were. They smell better than they have in a long time. Keep in mind that if your towels are getting old and need replaced, this method will not make them look like new again. It will also not remove bad stains in your towels. If you have a stain that you really want to remove, try applying a paste of Dawn dishwashing soap, hydrogen peroxide, and baking soda to the stain and let it set for a couple of hours before washing. *Note: A lot of people use bleach to whiten their kitchen towels. It is fine to use bleach when doing normal washing, but if you are using ammonia DO NOT add bleach to the washing machine. Bleach and ammonia are a very toxic combination and should never be used together. If you find your kitchen towels are extra greasy, try placing some white vinegar in a spray bottle and liberally spraying the greasy areas of your towels. Place towels in washer and launder as usual. White vinegar also works great for removing lingering smells from kitchen towels. Place a cup of white vinegar in with your wash and the vinegar will help get rid of the smell. You can also use a cup of baking soda in the place of the vinegar. 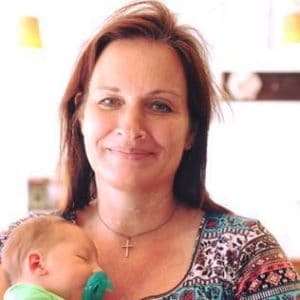 Follow my cleaning tips and laundry tips boards on Pinterest. 1 Comment on "How to Clean Dingy Kitchen Towels"